Reading a scholarly catalogue volume, we sometimes get the impression that there has been nothing new happening in the study of Renaissance art. This is perhaps true for some of the more traditional aspects of art historical contemplation, such as the discussion of allegory and its links with the broader historical context of the patron and period. What is less known is that there are many discoveries still to be made. In Italy alone, there lie millions of archival documents yet to be examined. I'd like to present an example of this - a summary of an article presented in the June 2011 edition of The Burlington Magazine. Founded in 1903 by art world heavyweights, Roger Fry, Bernard Berenson and Herbert Horne, The Burlington Magazine has become a leading English language publication for art news and reviews. Subscription prices for its print or online editions are quite high, unless you are lucky enough to be a student, or belong to an institution favoured by its access policy. Added to this is the fact that, despite public domain law, issues of The Burlington greater than 70 years old are still not freely accessible. These points aside, The Burlington remains a place where glory seeking writers and art historians will take their new discoveries. For example, Nicholas Penny triumphantly announced his re-discovery of Raphael's (contested) Madonna of The Pinks via The Burlington in 1992. With the advent of the web, perhaps the role of such a magazine will diminish? Why should new knowledge only be accessible to closed off groups of scholars and people who can afford the privilege of paying, or as an astute art historian once noted "the lucky few"? I take great pride in 3PPs open access, and hence I am happy to present this detailed summary of the new discovery, only touched on by other sites. My only wish is for the next archivist that stumbles across an interesting document to think about spreading their discovery to as many people as possible via the web. The featured piece does not provide any details on the author in the body of the article, such as is often seen in scientific journal pieces. This may be contained elsewhere in the volume, which I do not have access to. After a small amount of digging, one will discover Professor Renata Segre is a specialist in Venetian Jewish studies, which there is a small hint of in the piece when she refers to Jewish themes seen by some interpreters of Giorgione's works. More detail about Professor Segre, including a bibliography can be found here. We can now explore the fascinating discovery reported by Professor Segre. In the piece A rare document on Giorgione Segre presents a unique document shedding light on aspects of Giorgione's family life that were previously not known. The most important discovery is perhaps the mention of Giorgione's family name, not Barbarelli as widely reported, but Gasparini. The Barbarelli were related to Giorgione's father through marriage, but this was not the family name of Giorgione's father, revealed for the first time as Giovanni Gasparini. Further clarifications are made with regards to Giorgione's mother and stepmother, with the similar sounding names of Altadonna and Alessandra. Because of these assonant names, some authors had assumed that the references were to the same person, but details outlined in Segre's piece make this less likely to be the case. Of great interest is the description of Giorgione's possessions, as noted in an inventory of a house he was occupying. An absence of artistic materials lead some to suggest the place had been plundered, or that his artistic workshop was at another location. "..one gets the impression that this is a household in considerable disorder, with items not properly stored, but muddled up with pieces of furniture: beds, benches, a table, a few domestic objects and kitchen equipment. The small amount of clothing was in a bad state, mostly in drab and dark colours; and the mention of a few shirts (‘camise’) and a woman’s satin dress are not enough to prove that a woman was living in the house, still less a family. 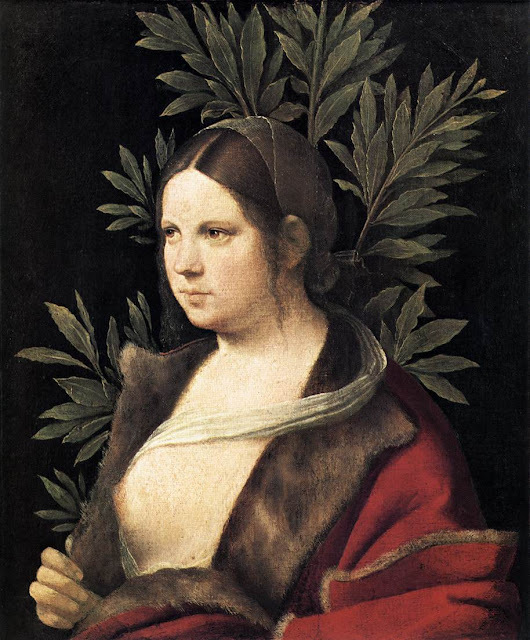 But the list of Giorgione’s effects drawn up on 14th March 1511 is not complete; seven months later, on 13th October, a valuable red gown lined with fox fur was added to the inventory, and the Ufficio di sanità was urged to return the belongings Giorgione used during his quarantine at the Lazzaretto nuovo(*)." (*)The Lazzaretto nuovo was a small island in the Venetian lagoon where plague victims were quarantined. After falling ill, Giorgione was moved to this location and eventually died there. Something which seems to have been overlooked by Segre and other commentators on this piece is the significance of the "red gown lined with fox fur". As Giorgione's catalogue of paintings is small, it did not take long for these words to recall the painting commonly known as Laura, where a woman wearing a fur-lined red garment is shown. This is exciting for Giorgione scholars as this inventory potentially adds to the provenance of the Laura painting. This work, currently housed at the Kunsthistorisches Museum in Vienna is the only Giorgione work that identifies the author and date via an inscription on the back. As The Burlington is presented in scholarly manner, with half the page consumed by footnotes, reading through this section provides as much insight as the article itself. Why writers persist with this archaic tradition is perplexing, it would simply be more enjoyable to include all the relevant details in the piece, and leave the citations for a reference list. In this manner, one effectively ends up reading two separate, but related narratives of the same topic. Using the dates suggested by the inventory, Segre speculates on Giorgione's year of birth, and provides a fascinating clue that some may regard as a possible lead for that other famous Giorgione painting, Tempest, known in Italian as La Tempesta. Tempest is one of the most discussed pieces in the history of Western art. There are presently over 150 publications on the piece in various languages, with the most thorough assay of this being Professor Salvatore Settis' book. Tempest has also been covered at length at 3PP, including mention of Waldemar Januszczak's classical(Homeric) reading and Dr. Frank DeStefano's iconographically thorough interpretation of the work as an inventive variation of The Rest during the flight into Egypt. "..the uncertainty that surrounds the artists date of birth and his relations with his maternal family, allow me to suggest that his birth fell in the mid-1470s which, for Castelfranco, was a period of grave disorder and violence, with clashes between the two powerful local families, the Tempesta and the Callegari." Of the myriad, often fanciful readings of Giorgione's Tempest, neither of the most prevalent theories account for this family feud - which provides a more obvious historical context for allegory than those ascribed to Virgilian or Homeric readings. It is true that Giorgione's Tempest can be a painting with many meanings at once, perhaps one with an overriding sacred meaning, but ignoring this congruence of names would be perilous to any serious Giorgione scholar. As Segre notes, it was actually a member of the Tempesta family, acting in an official role, that requested the inventory of Giorgione's possessions to be created. It is tantalising to ponder what other connections may exist between Giorgione, his family and the Callegari/Tempesta family in general. Not wanting to get too sidetracked however, this shall be an investigation for another day. Armed youth, birth, death and a city besieged by a storm. Is Tempest a history of Castelfranco? Inventory of the belongings of Giorgione da Castelfranco, deceased, drawn up at the request of Francesco Fisolo, the heir of Alessandra, widow of the painter’s father, the late Giovanni Gasparini. (Giudice del proprio, Mobili, registro 1, fols.46v–47r, 14th March and 13th October 1511). Die 14 martii 1511. Mandato dominorum iudicum ac in executione litterarum domini Antonii Tempesta, vicegerentis domini potestatis Castrifranchi, diei 8 instantis officio directarum, ad instantiam ser Francisci Fisoli civis Castrifranchi, uti heredis quondam domine Alexandre uxoris quondam ser Iohannis Gasparini de Castrofrancho, cupientis satisfieri de dote ipsius quondam mulieris sive de residuo dotis huiusmodi, prout in ipsis litteris plenius, retulit ser Zaninus Ioannis, preco et minister palatii, estimasse bona infrascripta tamquam bona quondam magistri Georgii pictoris filii et heredis dicti quondam ser Ioannis Gasparini, iuxta dictarum litterarum requisitionem, et illa appreciasse ducatos septuaginta auri, que bona sunt in [= ut] in presenti inventario continetur. Die 13 octobris 1511. Ad instantiam utsupra, retulit idem preco estimasse unam vestem pani pavonazi de grana fulcitam vulpibus ducatis decem novem, computatis ducatis septem quos dare debet Officium sanitatis pro nonnullis rebus dicti quondam magistri Georgii pictoris retentis ad hospitale Nazareth(Lazaretto nuovo) Venetiis. In conclusion, Professor Renata Segre's piece is a fascinating, albeit fleeting glimpse at the life and death of the enigmatic Giorgione. It demonstrates the power of ongoing research to complete biographical details and cause the re-writing of textbooks. Not being an art historian, perhaps Segre missed, or was not interested in the connections with Laura or Tempest. The tantalising clues offered by this small document warrant further study. Junkerman, A C. The Lady and the Laurel: Gender and Meaning in Giorgione's Laura. Oxford Art Journal. 1993. 16 (1): pp.49-58. Fascinating, and the connections you make to the Tempest and Laura paintings are intriguing. Do you (or Frank!) know whether anything has been written about the possible symbolism of fox hair in the Laura? Or has it just been generically identified as fur? Hi Ben, that's an interesting observation. Despite it being one of the more firmer Giorgione attributions, like many of his works, its theme and allegory are the subject of some debate. Jonathan Jones does a decent summary of what you would see in many general art history texts on this piece at the Guardian - the key point being that the moniker "Laura" came from the 17th Century, as writers(and other artist) described the Laurel plant, and likening it to the famous "Laura" Petrarch was so enchanted with - whom it must be mentioned had fair hair! Jones' conclusion that Petrarch's Laura and Giorgione's Laura are unlikely to be the same subject are valid for this and other reasons - the key factor being that like Dante's idealisation of Beatrice, Petrarch's fascination with Laura was an example of Courtly (or Platonic) Love. The bare breasted depiction of Giorgione's figure is less congruous with this. Like Tempest, there have been Sacred interpretations as well, including mention that it represents Magdalene, though some of her key symbolic attributes are missing - most notably the jar. Frank would be better able to comment on the sacred readings of course. Conversely, others, such as Anne Christine Junkerman have looked at Laura as a contemporary woman, suggesting not unlike Jones at the Guardian that Laura may have been modelled on a real person, possibly a courtesan - not an uncommon practise among Renaissance artists. Wow, interesting news - especially the bit about the family name! I'll have to look at this article in more depth. I liked Ben's question about the fox fur. Laura's gesture in touching the fur robe is a little bit similar in composition to one of Durer's self-portraits. Though I don't know if there is a direct connection (I'm wary to say so), it is interesting that the two paintings are only about six years apart. Scholars have said that the robe in the Laura is the type worn by Venetian courtesans. I look forward to reading the full article. Until then it will be hard to say if the red gown in the inventory is the same one depicted in the Laura. I've never seen anyone try to identify the type of fur in the painting. I looked up the Laura entry in the 2004 exhibition catalog (Giorgione: Myth and Enigma).Written by Giovanna Nepi-Scire, it said, "Her sumptuous fur lined garment is, more than an item of male attire, the winter dress of Venetian women of pleasure....However, as noted by Goffen(1997) the thin white veil that partly cveers her hair and falls over her breast is a typical accessory of married women....The paradox that accompanies the interpretation of this painting lies in the fact that laurel is also a symbol of conjugal virtue." She also compares the Laura with Leonardo's Ginerva de Benci. There is a separate essay by Elke Oberthaler that examines the x-ray and radiographic reflectography of the painting. Cheers Frank! What an intriguing piece of evidence this inventory is turning out to be. It definitely fits in with the notion that Venetian artists used courtesans as models, as Titian was also known to do. I also keep looking at the entry that says "tapestry decorated with foliage design" - The foiage depicted like that, with an absence of landscape and even a trunk seems quite uncommon. It is not unreasonable to argue that the model could have been posed in front of a tapestry of such design. The absence of a landscape in underdrawing scans seems to further suggest this. Just a short comment, as far as I know, one sense of volpe (fox) is a cunning woman. In Spanish zorra (volpe) could be a prostitute, but I don't know if the same applies in Italian. A plain visual metaphor? Hello Begoña Cayuela! Welcome to 3PP! This seems to make sense - the fox, even the she-wolf has long been associated with prostitutes. The oldest example I can think of is 'Romulus and Remus' who were said to have been suckled by a she-wolf - as described in Titus Livius' History of Rome (and other sources), this was more likely a metaphor for a prostitute used as a wetnurse, rather than it actually being a wolf as the famous reliefs and sculptures depict. An excellent post! The commentary on the Burlington magazine was completely appropriate. It is so irritating to delve into a research quest, only to find some of the best resources blocked by ludicrous and arcane rules. Knowledge is to be appreciated and shared, not hidden away like a prized jewel for the elite. The discussion on the fox lined gown brought to mind what other treasures await in these archives. So much to be learned, so little time! Cheers @thiswritelife! As Segre is a specialist on historical and political aspects of Venice, I can only imagine this was a chance discovery as she was researching for something entirely different! Who knows what more chance discoveries will reveal as more of the archives are explored - it's an exciting prospect! @Anon - Now there's another enigma.. We indeed know very little about Zaroto. Vasari's account of him is interesting, but how much can we rely on it? Many thanks for that Diana - I have encountered Nauplion.net in the past, it is nice to know you have a blog too.